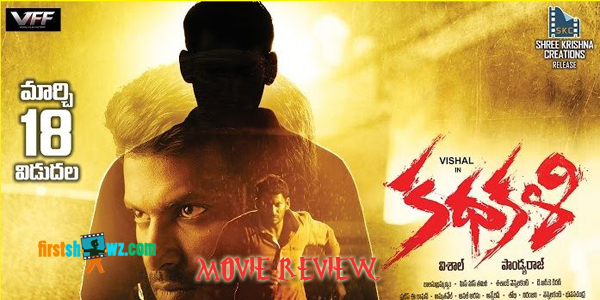 Firstshowz brings you Vishal’s Kathakali Movie Review this weekend. Vishal starrer Kathakali film is released all over today directed by National Award Winner Pandiraj. The film has Catherine Tresa in female lead role. Kathakali is produced on Vishal Film Factory banner alone by Actor Vishal with Hip Hop Tamizha as the music director. Kamal aka Kamalakar Reddy (Vishal) on a cause leaves his hometown Cuddalore and goes to USA will return after five years. Kamal who is all to marry his girlfriend Malleswari (Catherine Tresa) comes back to India and visits many places to invite his close ones to his wedding. On the process, Vishal comes into clash with Sambasivudu (Madhusudhan Rao), a Fisher Association President who keeps on troubling Kamal's family. As the time passes by, twist in the tale arises when Sambasivudu is brutally murdered. The investigation reports suspects Kamal is involved in the murder. Will Kamal be saved from the Sambasivudu murder case? Who killed Sambasivudu is worth watching it on big screens. Vishal as usual comes with unique plot and the actor gives his matured performance in this film as well. Catherine Tresa has not much scope in performing in this film and the role is limited for songs and few love scenes. Madhusudhan Rao's Sambasivudu role is the central lead through out the film and scores a major asset in the form of twists. Mime Gopi, Lakshmi Ramakrishnan, Pawan and Sreejith Ravi are decent in their respective roles. Hip Hop Thamizha's tunes has not worked well in this film's plot. The Background Score gets all credit for the music director. Editing could have been better. Director Pandiraj plays it safe with engaging content. However, the film has nothing to do with lots of boring scenes. Though the director has etched it well enough with gripping screenplay, the predictable plot drags him to score a much necessary output. Kathakali is all about a murder mystery which deals with good screenplay. Apart from the lead pair love scenes and songs, the film is good in execution. Vishal and Madhusudhan Rao's roles are the highlights with gripping screenplay and decent visuals. The film first half goes on slow pace with most of the scenes on the lead pair and spoils the audience mood with unnecessary scenes and untamed song placements. The second half gives an enough twists with nice background score. However, the director could have taken care in elevating the roles with interesting turns.